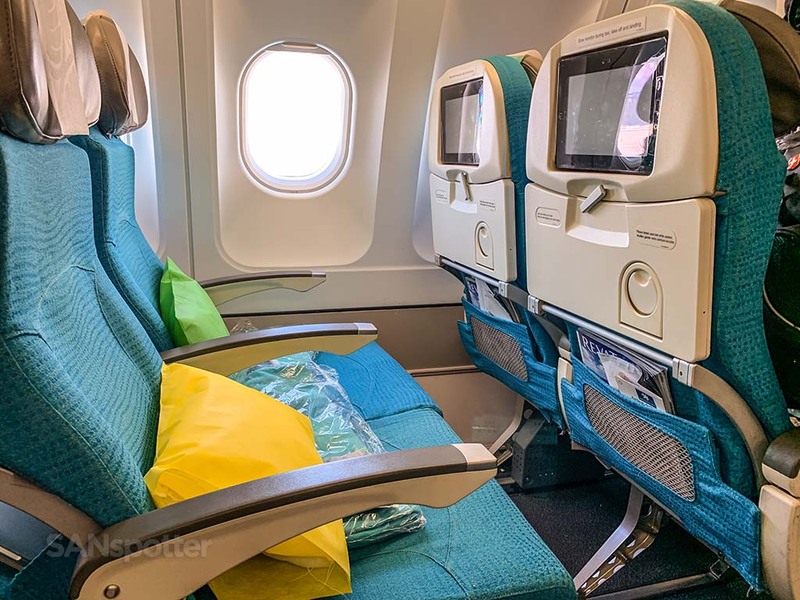 I’ve been reading a lot of really good Air Tahiti Nui reviews over the past few years, and to say that I’ve had a bad hankern’ to fly this airline is an understatement. 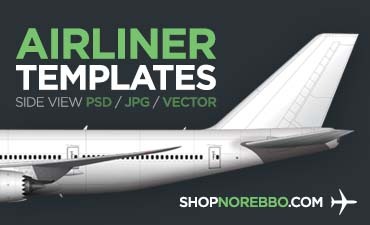 They’ve got one of the best liveries around, they fly to one of the most beautiful places on earth, and the rarity of actually seeing one of these planes (if you don’t live near Papeete, Los Angeles, or Paris) gives them a chic “exclusivity” factor that is off the charts. The romantic part of me always figured that my first Air Tahiti Nui encounter would be an exotic experience from beginning to end. It would start with being wined and dined in a dated but cozy business class seat, followed by a deeply blissful slumber. A deeply therapeutic slumber which would only be interrupted by flight attendants coming by every so often to gently wipe the drool off my chin with flower-scented towelettes. 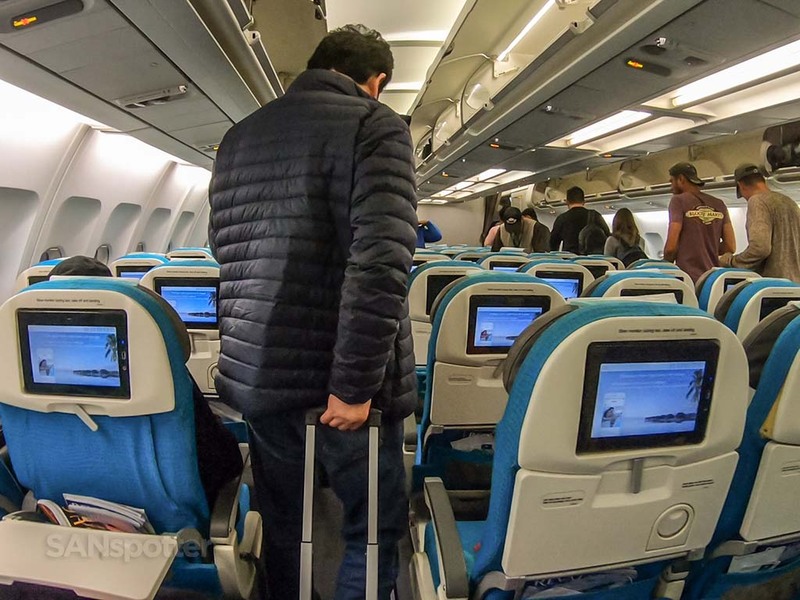 Finally, the flight would end by stepping off the plane under rainbows and swaying palm trees in Tahiti, only before being whisked away by a friendly (and beautiful) Tahitian taxi driver to my 5-star hotel room featuring private beach access. 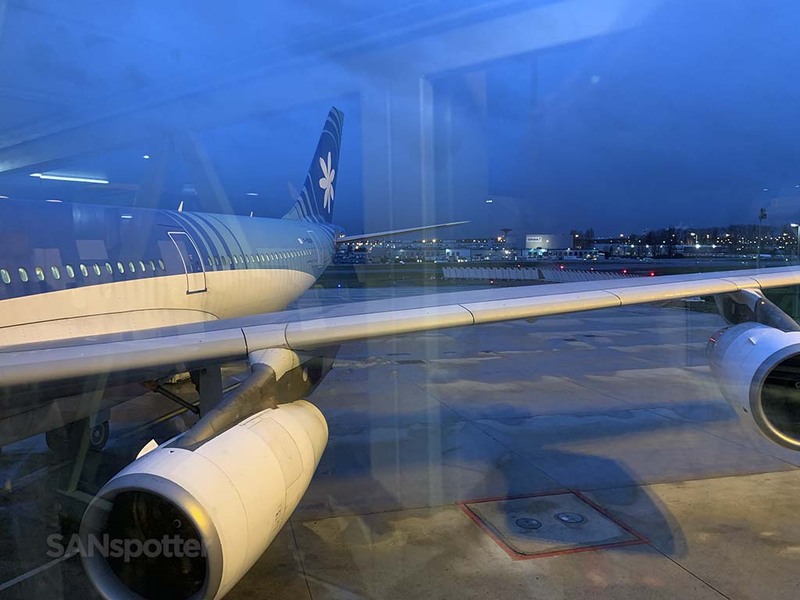 It was going to be one of the best Air Tahiti reviews ever! Unfortunately, it didn’t work out quite like I thought it would. 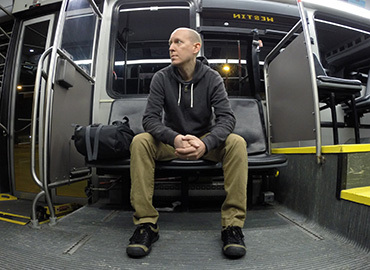 Instead, I froze my *** off for 10 hours deep in the bowels of a packed economy class cabin on the way to…Paris. Now, I’ve got nothing against Paris, but it ain’t Tahiti. And I didn’t sleep a wink either, so I have nothing to report on the drool-wiping techniques of the flight attendants. Air Tahiti Nui A340-300 side view illustration by Norebbo.com. A very difficult yet highly satisfying livery to illustrate! 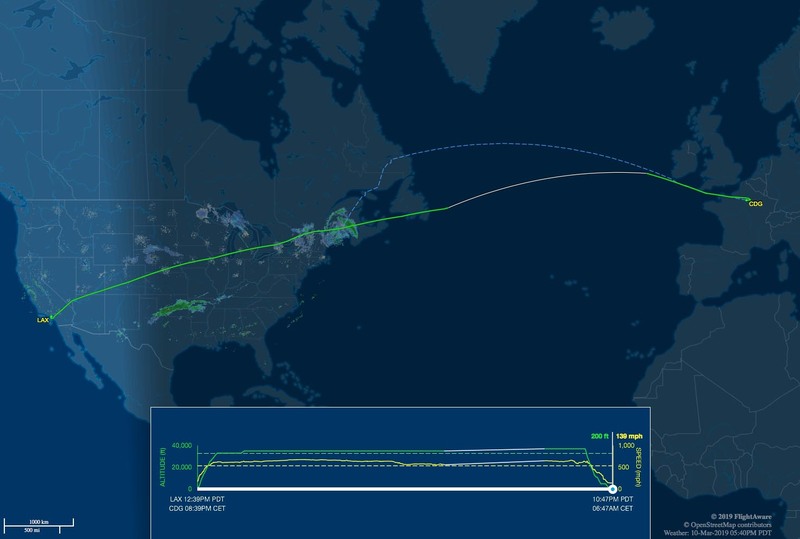 Seat map of this Air Tahiti Nui A340-300 (courtesy of seatguru.com) showing my seat (22D) for this flight to CDG. 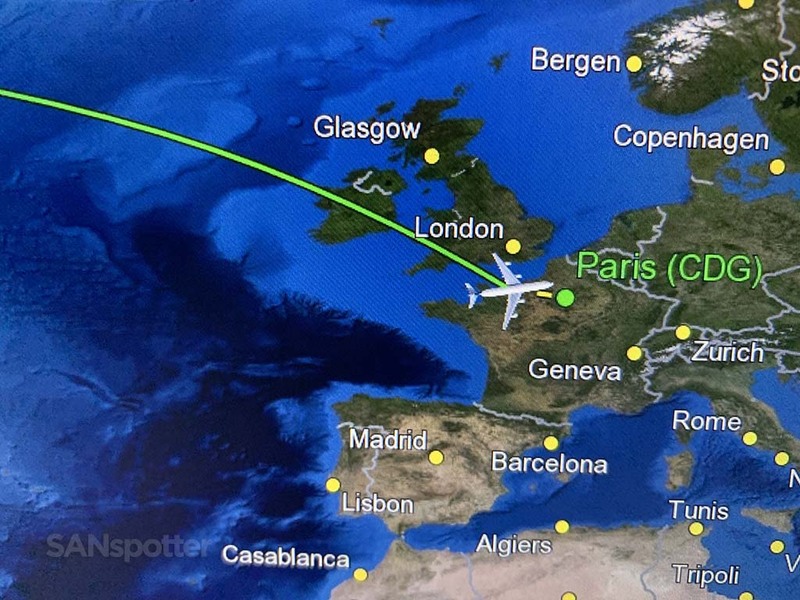 Our route from Los Angeles to Paris today. 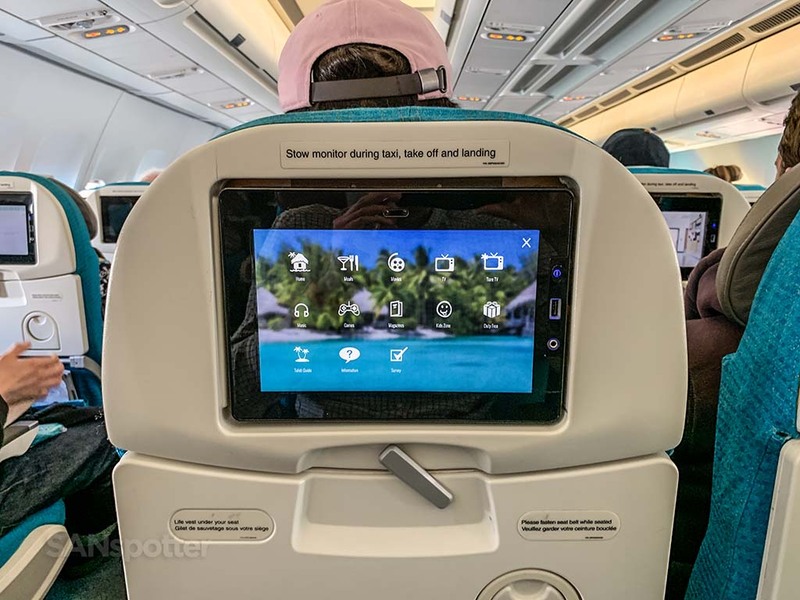 As I mentioned in the introduction to this post, the fact I was unable to include tropical sunset scenery in my video (like all of the other Air Tahiti Nui reviews on YouTube) was discouraging to say the least. However, in typical SANspotter form, I tried my best to make lemonade out of lemons and ended up having a lot of fun putting this particular video together. Epidemic Sound, as always, provided the soundtrack, and it’s a pretty good one at that. If you need music for your own YouTube videos, it’s a source I can’t recommend highly enough! Be sure to read my full review if you want to learn more. Even though I’ve spent a majority of this review so far appearing to feel sorry for myself for the fact that I was going to Paris and not Tahiti, the truth is that I specifically chose this flight for the sheer novelty of it. 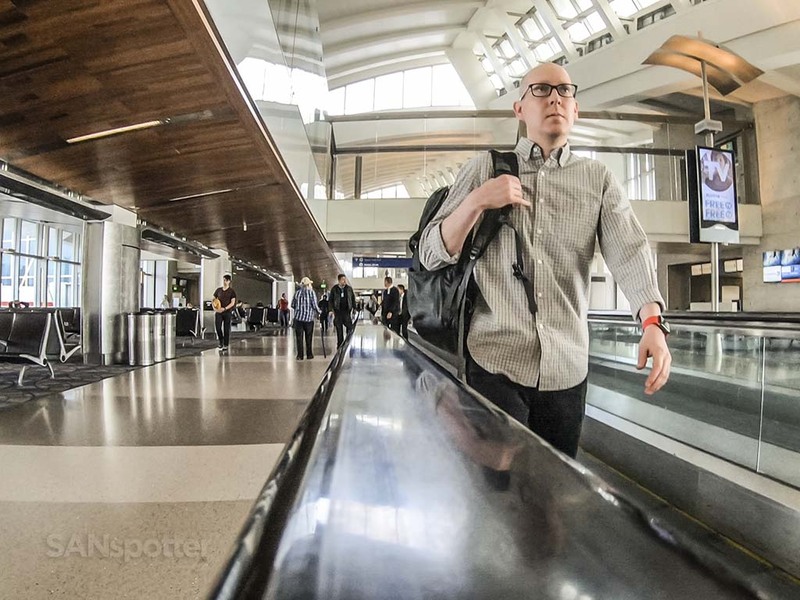 I flew up to LAX from SAN on United this morning, which meant experiencing the joy of the underground walkway leading to the Tom Bradley Inernational terminal. 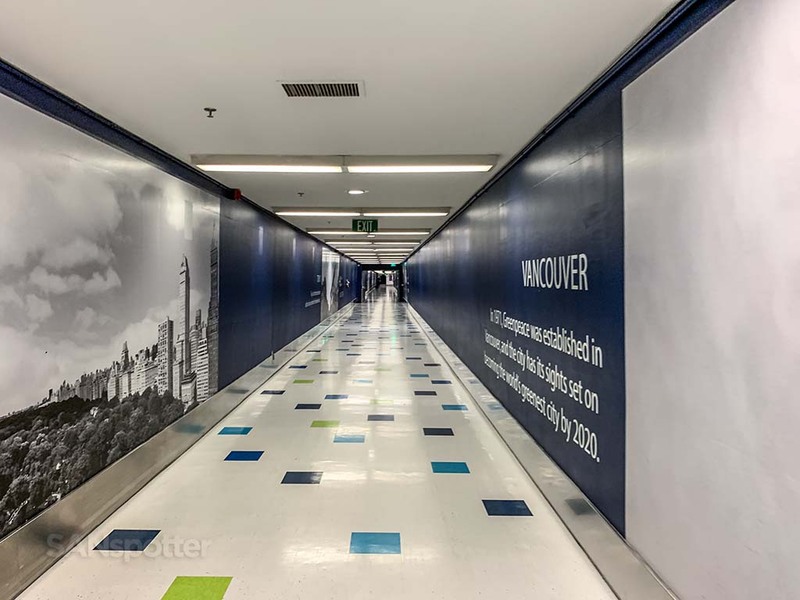 If I wasn’t lugging a 20lb backpack on my shoulders, I’d be running through this tunnel at full speed, arms flailing, laughing hysterically all the way. I love kicking off big international adventures out of LAX! 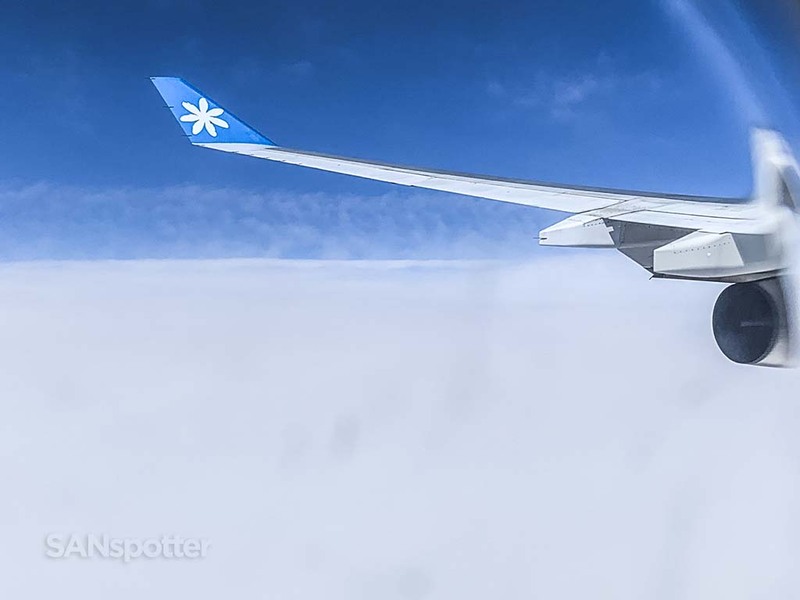 For those that aren’t aware, Tahiti is French-owned territory, and therefore, Air Tahiti Nui is just as French of an Airline as Air France is (well, pretty much). 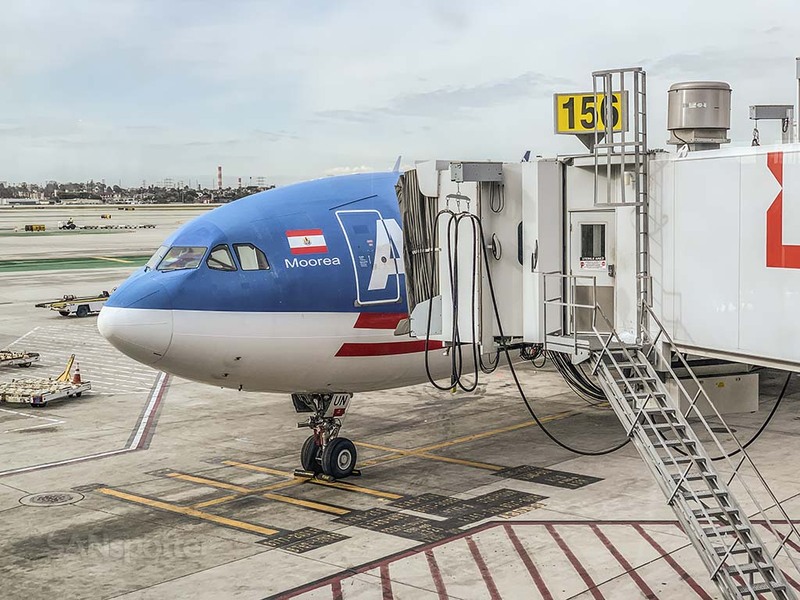 LAX is simply a fuel stop between Papeete and Paris, though they do have fifth freedom rights to carry passengers solely between LAX and CDG. Neat huh? 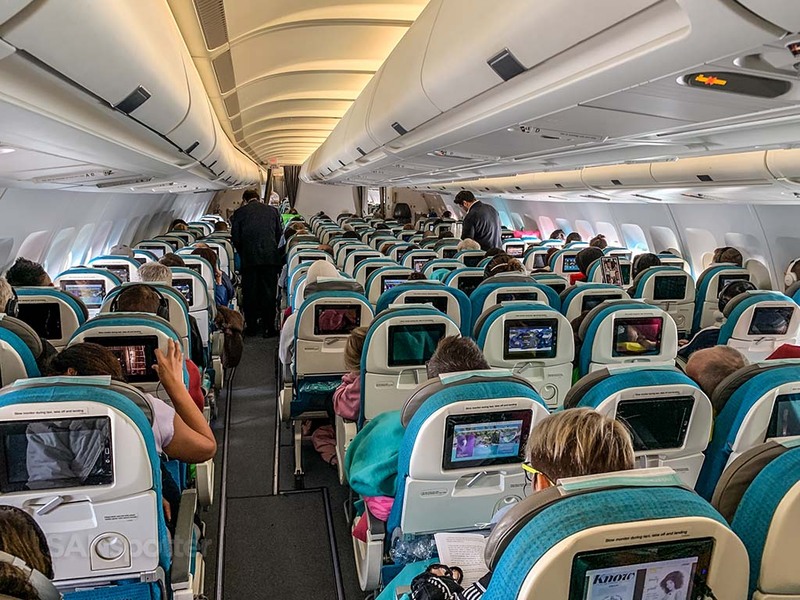 I’m eventually going to fly to Tahiti, and when I do, you can bet you’re you-know-what that I’ll be writing one of those epic Air Tahiti Nui reviews I’ve always dreamed of writing. But for today, it’s simply going to be a review of a peculiarly neat (and somewhat oddball) route. 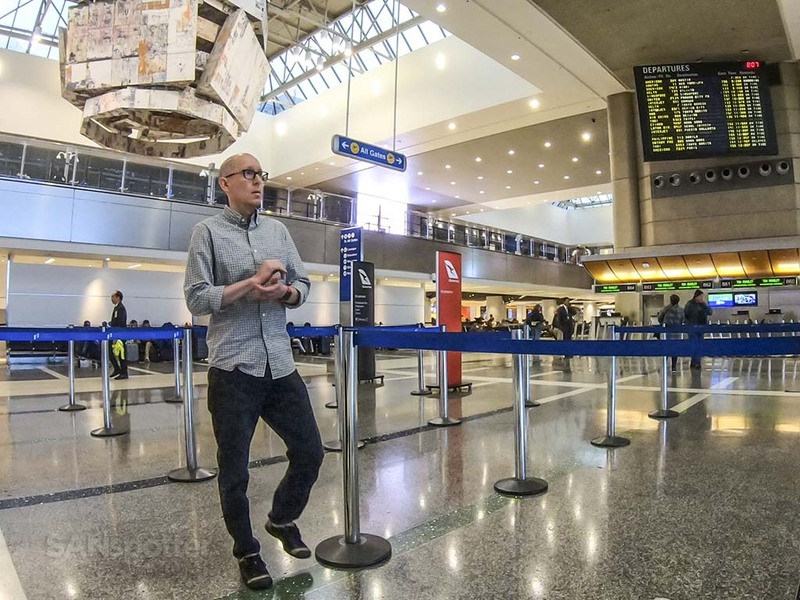 The departure out of LAX today was scheduled for 12:25PM, and the check in counters opened at 9:30. My flight from SAN arrived at 7:30, so I had plenty of time to stand in line and think about why didn’t even check to see if there was a way to check in online. A few taps of my iPhone revealed that yes, it was possible – but not within 36 hours of departure. Any time before that would have been ok, but 36 hours was the cutoff. Huh? No matter though – I was the second person in line and waited patiently for the counters to open. 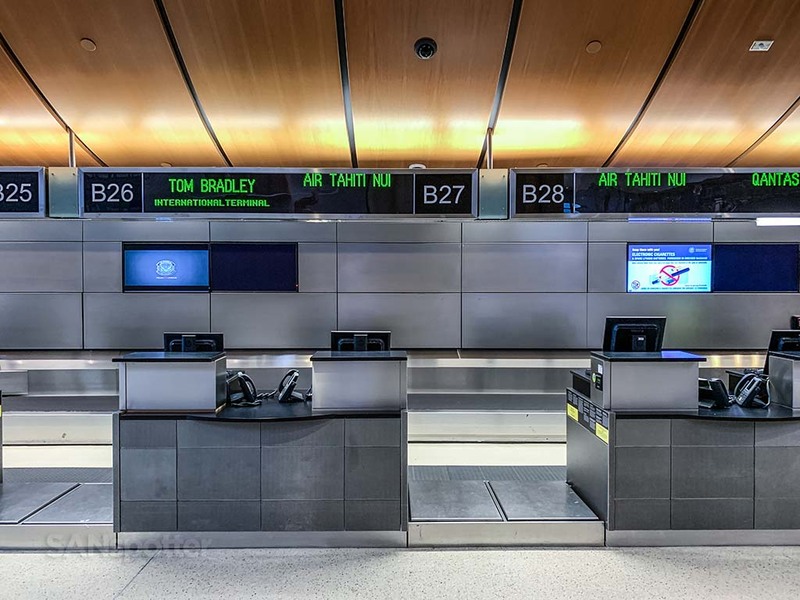 If you’ve been to sanspotter.com more than once, pics of unoccupied check in counters should be a familiar sight by now. I’m not early btw. I’m prepared af. Big difference. Unfortunately, there was no one else around to admire how prepared I was. What time is it again? Flying economy class meant no lounge access, and to make matters worse, my Priority Pass membership wouldn’t even get me into the coveted KAL lounge. 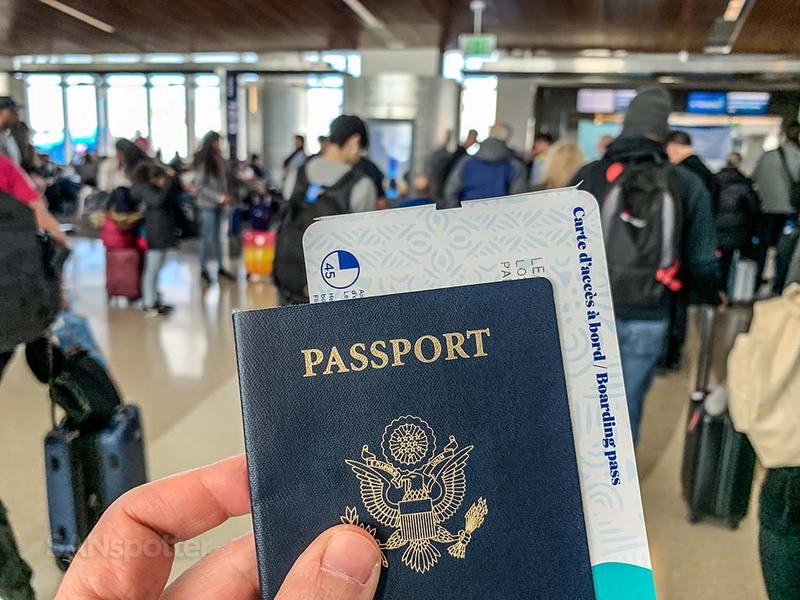 Yep, mid-mornings are off limits to lowly Priority Pass card holders such as myself, which is entirely due to the 12:30PM Korean Air flight to ICN and those passengers having priority access. In cases such as this, there’s nothing “Priority” about my membership and I’m just a regular shmuck who has to hang out in the main terminal with everyone else. Yet another reason why this isn’t going to be one of the most epic Air Tahiti Nui reviews ever. When it comes to hanging out in Airport terminals, the Tom Bradley here at LAX is not a bad place to do it. 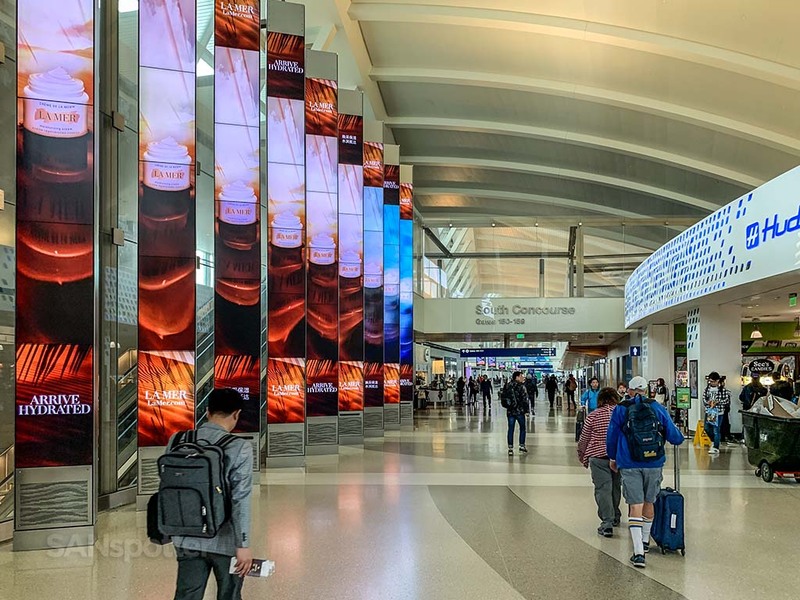 It’s large and modern, and it gives me an irresistible urge to go back in time, track down that Tom Bradley guy, and shake is hand for whatever it was that he did to get a beautiful airport terminal such as this named after him. Thankfully they didn’t finish that welcome message with a snarky reminder that it would be a lot more fun going the other way (to Tahiti). 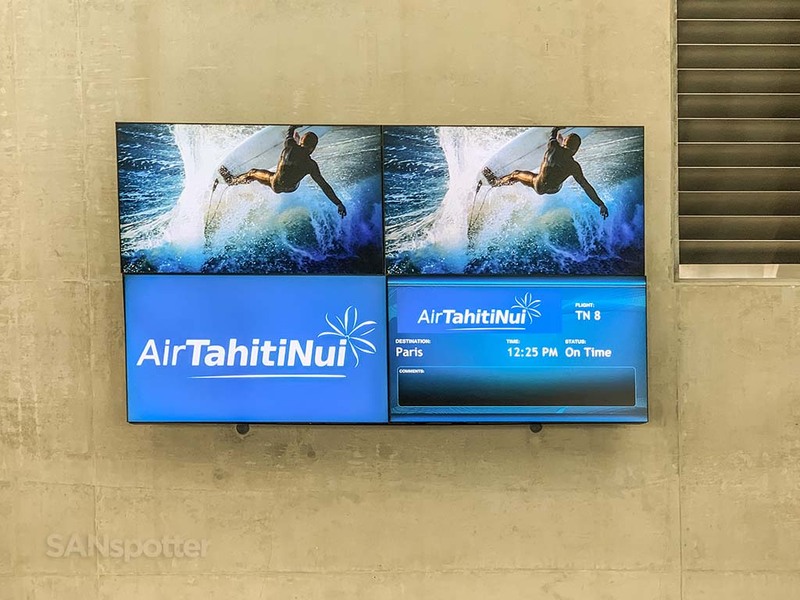 Instead, it was business as usual here at gate 156 and I was getting excited about adding my name to the list of other bloggers who have already written Air Tahiti reviews. 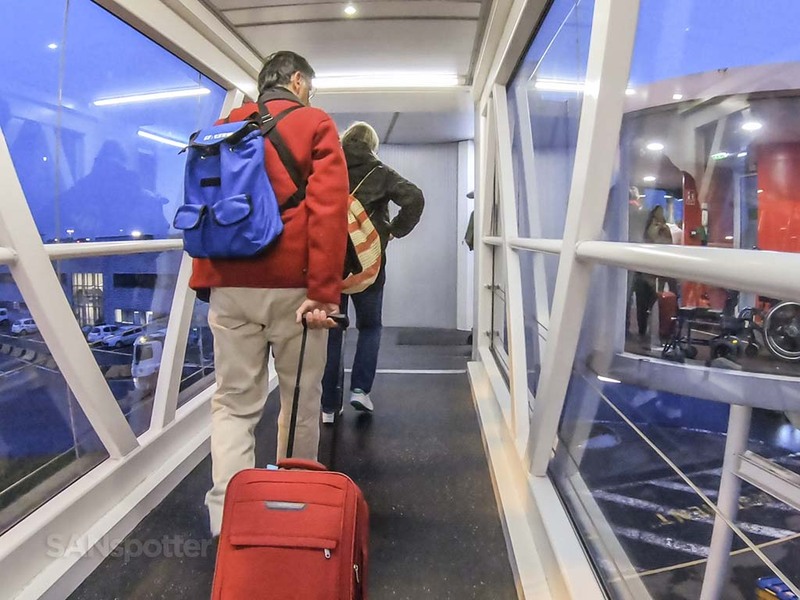 Not that I think that a TN review is the defining objective for any legitimate travel blogger or anything, but this is an airline I’ve always had a major crush on. Um…the least they could have done was be realistic and replace that surfer pic with one of a miserable tourist freezing to death on the streets of Paris. F-OSUN doing the honors today, an aircraft I used to photograph often in my aviation photography days. I’m glad to see her still looking as sharp as ever! The iconic Air Tahiti Nui colors. Thinking back on it, it’s a really good thing I didn’t blurt out “omg that’s SO hot” because that woman probably would have turned around and decked me right between the eyes (and deservedly so). 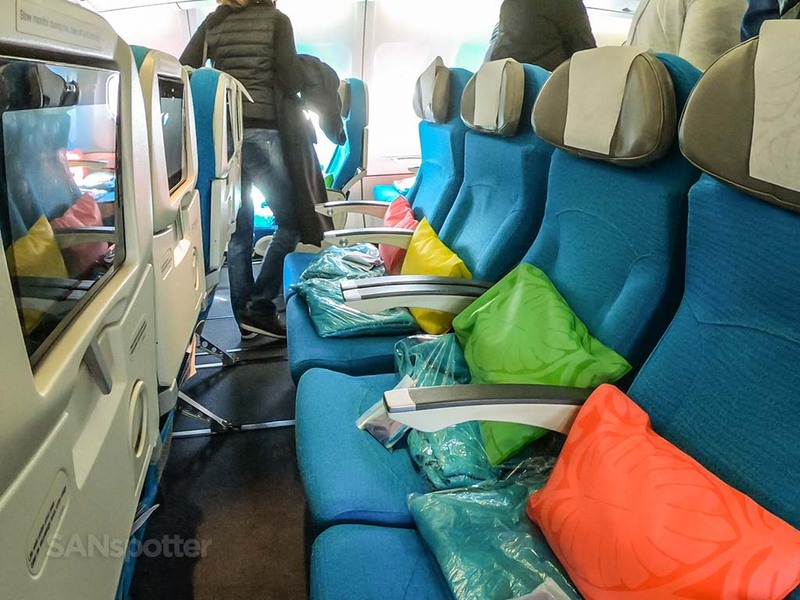 I mean, would you have expected anything less than neon-colored pillows and seats the same shade of turquoise that Hawaiian Airlines uses in their 717’s? For the record, I’m not hating. 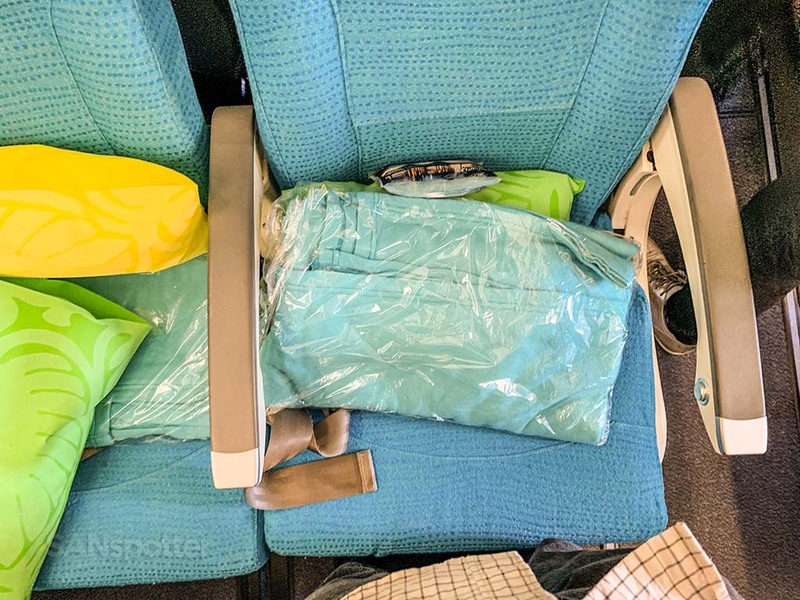 I actually think this color scheme is perfect for the Air Tahiti Nui brand, and I would have been seriously disappointed if I didn’t have the option of choosing what neon-colored pillow to cry into as we flew farther and farther away from Tahiti. Looks like my pillow here in 22D is lime green. But if I act fast, I can swap it out with the lemon-yellow one from 22E before my seatmate arrives! There’s always someone giving me the evil glare as I gather trip report content. It’s a good thing there are two big dudes between me and that lady in white, because the look on her face says that she hates my trip reports (and was about to let me know it). Seeing the interior of one of these old Air Tahiti Nui A340s for the first time was an odd sensation. On one hand, it was exactly like I imagined it would be with palm tree murals and tropical colors everywhere. On the other hand, I was not expecting the large seat-back video screens with USB ports. Seriously – I walked onto this airplane fully expecting to end this flight with a dead phone battery, but seeing those USB ports was a satisfying feeling like none other. 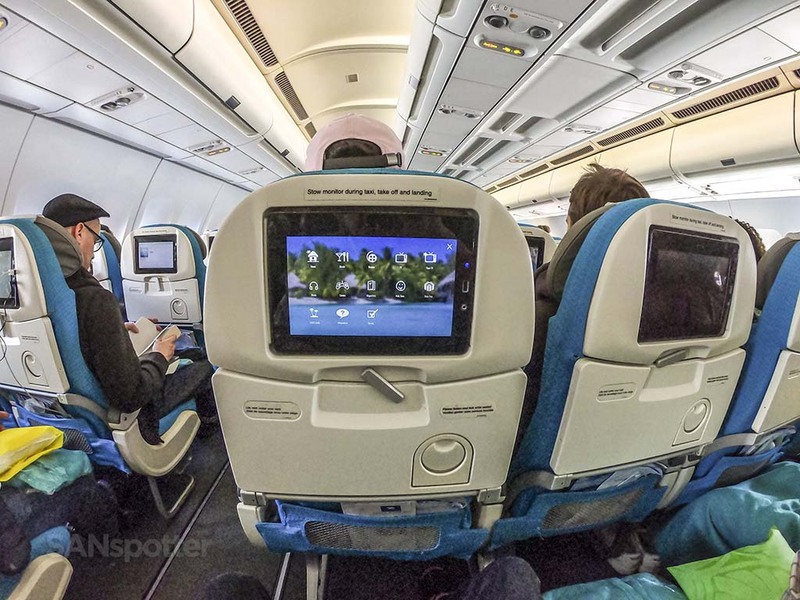 Who would have thought that there would be large video screens and USB ports at every seat? Certainly not I. And would you look at that? My knees aren’t even bleeding from being rubbed raw from the seat in front of me. Just look at that big and bright video screen! C’est la meilleure compagnie aérienne française. And I really mean it too (at least I think I do, because I’m not that smart and I needed the help of Google translate to spell it right). A wide-angle shot of the same thing, if only to brag that the seat next to me has remained vacant. 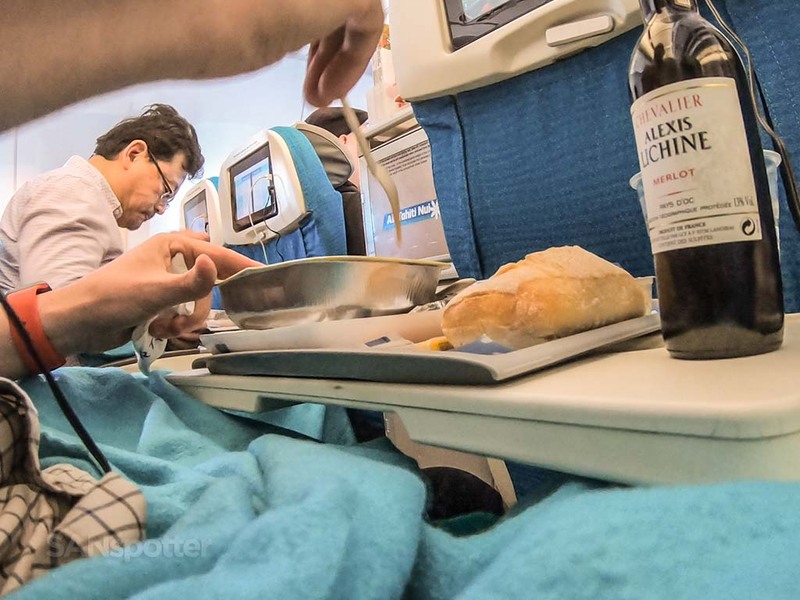 Imagine the horror of checking in late and realizing that the only empty seat left is next to a guy who’s gonna take pictures of his food all the way to Paris. It wouldn’t surprise me if he or she decided to wait until tomorrow’s flight. 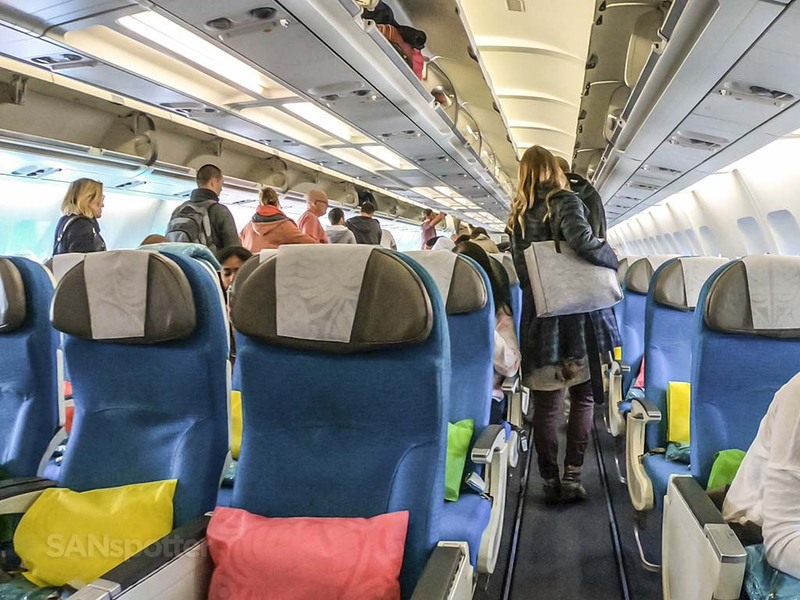 Another surprise was the fact that there were amenity kits and thick blankets at every seat. 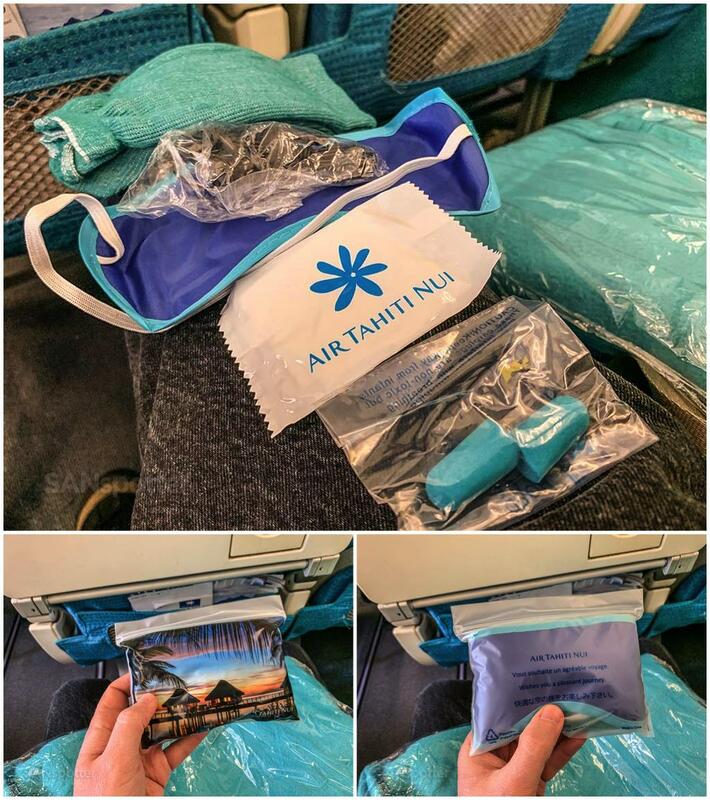 I was totally expecting paper thin blankets and crunchy pillows, so right away I was silently cursing myself for not making the effort to review Air Tahiti Nui sooner. This is a legitimate (and very competitive) airline between LAX and CDG and I can’t believe it took me this many years to figure it out. For real? Now I’m starting to feel bad for only paying $298 for this ticket. 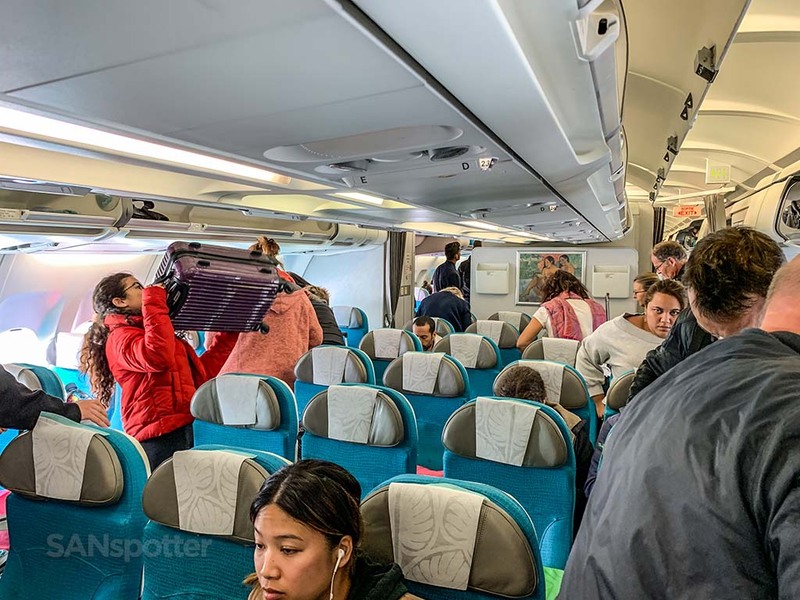 Apparently there were a lot of other passengers who got a really good deal on their tickets as well, because this flight was packed. 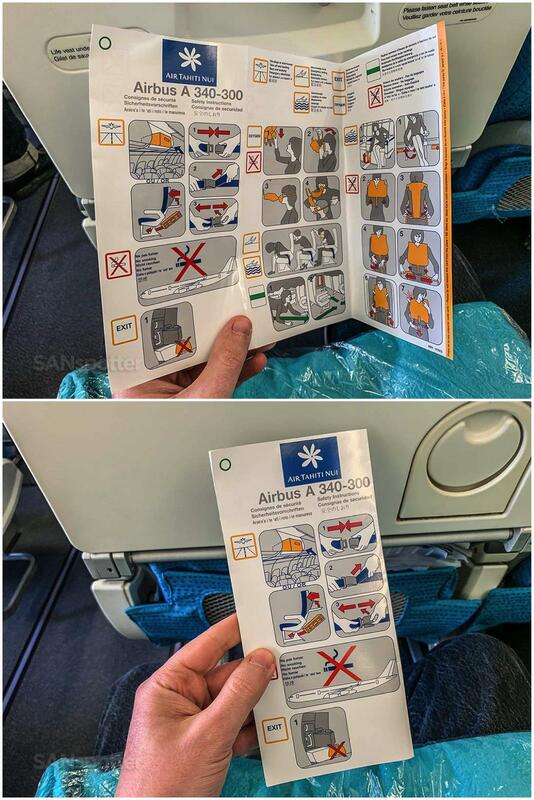 The Air Tahiti Nui A340-300 safety card. Really? Not even one person wearing a flower print dress or floral shirt? Psh. Hawaiian Airlines has got these guys beat in the “looking sharp while crashing into the Pacific Ocean at 600mph” safety card game. What better way to start a long haul flight than by getting stuck in the galley all by myself? 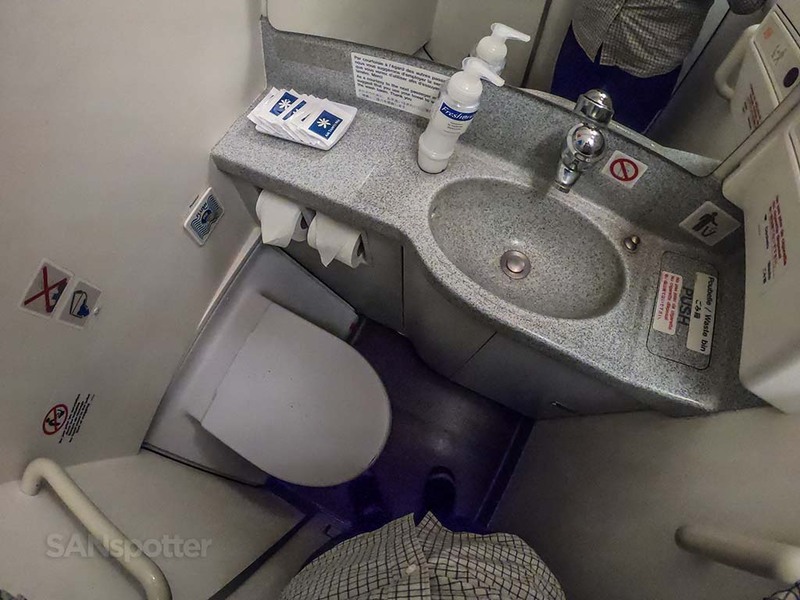 Immediately after takeoff, I had the brilliant idea of getting up to use the lavatory before the service started. 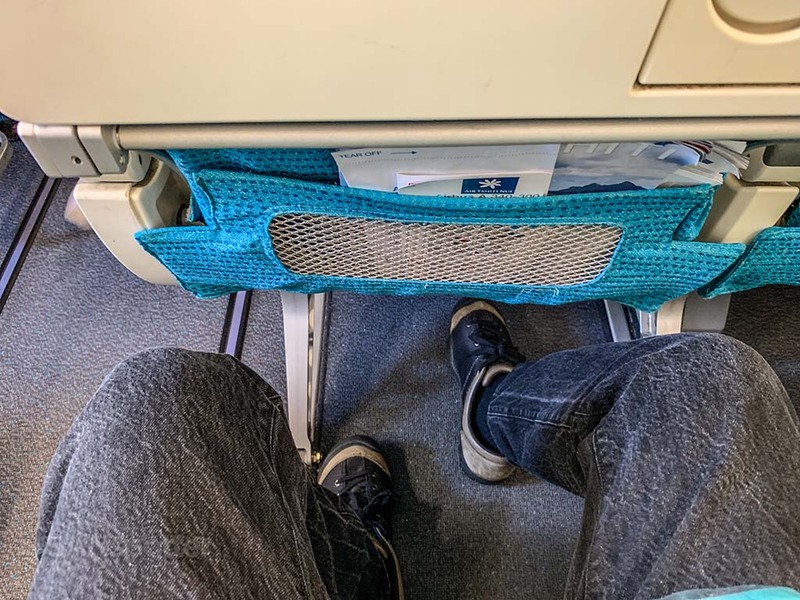 After all, if I wanted to add my name to the list of others who have already written great Air Tahiti Nui reviews, I needed to be comfortable. 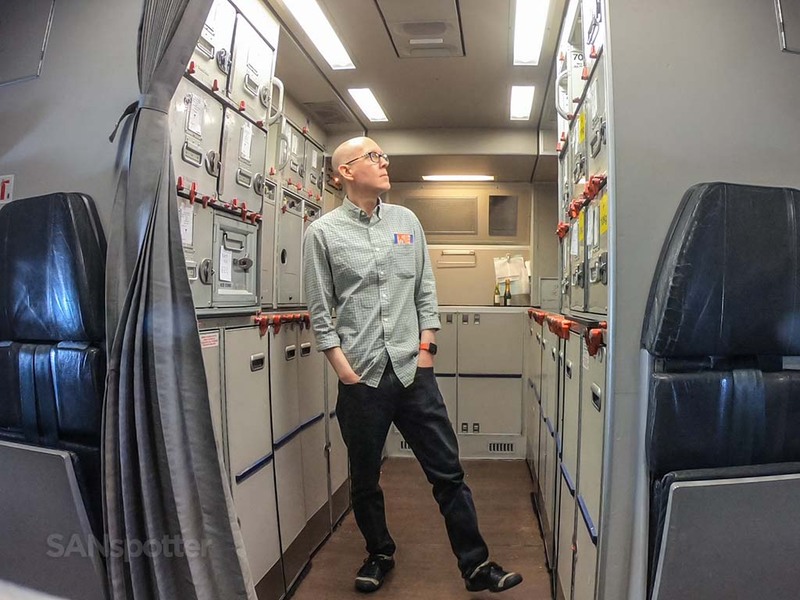 I walked all the way to the rear of the aircraft, where there are two lavatories separated by a large galley. 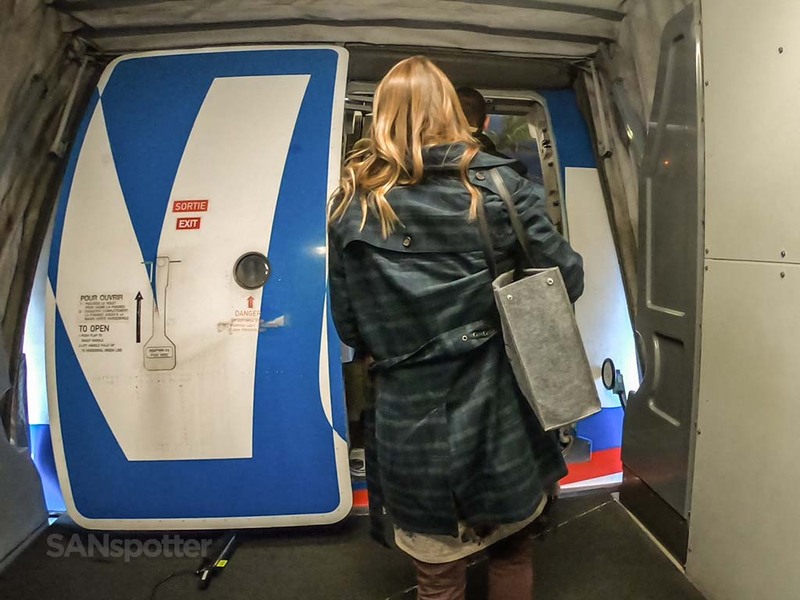 There were two flight attendants preparing service carts for the initial drink and snack service, and I didn’t think anything of it as I pushed the door of one of the lavs open and stepped inside. I wasn’t in there for more than two minutes, but apparently the flight attendants were quicker than I was and they had started the service from both the front and back of the aircraft simultaneously. There were three service carts in each aisle (at the front, mid cabin, and rear), totaling six that were completely blocking the path to my seat. Dang it. My seat is is in the forward section (past the bulkhead) and…it looks like I’m pretty much screwed. Of all the times to be trying to solve complicated math problems in the bathroom! The flight attendant nearest to me saw me standing there looking sad and dejected, and didn’t even offer to let me by. 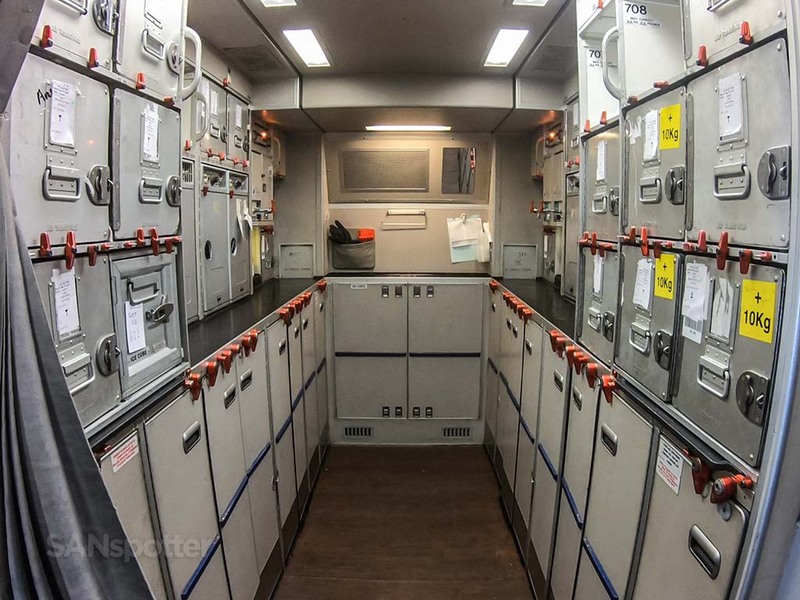 “Soon“ actually meant 25 minutes and I ended up getting a really good tour of the rear galley of this A340-300. 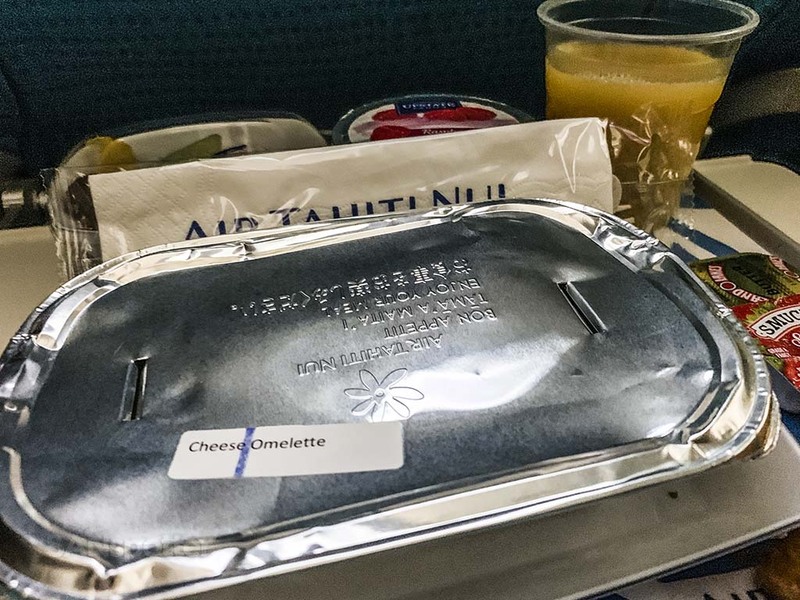 It also meant missing out on the snack service altogether, but at least I was able to start this Air Tahiti Nui review off with a semi-embarrassing bang. It probably looks like I’m starting to solve another useless math problem, but the truth is that I was thinking about the potentially delicious tropical snack I was missing out on. At least I was able to look out this tiny porthole window while I waited. Can you image how funny (I mean pathetic) I must have looked from the outside with my nose pressed to the window? Thankfully I made it back to my seat in time for the lunch service to start. If there’s one thing I can say about this Air Tahiti Nui crew, it’s that they were extremely fast and it was easy to miss out on stuff if I was being careless (and you’ve already seen that I was). There were no menus distributed back here in economy class, but we had the choice of Chicken or Beef. When are airlines going to get adventurous and offer things like Buffalo and Emu instead? 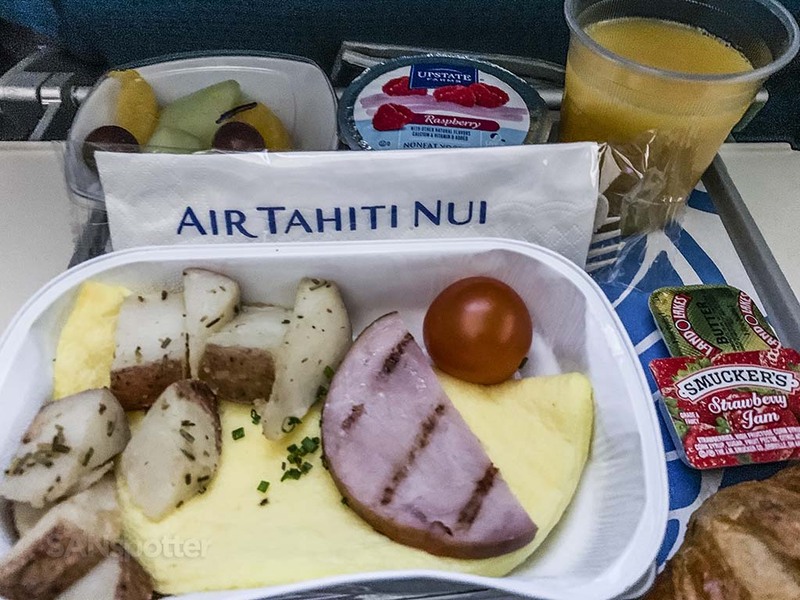 Heck, this is a Tahitian airline after all, so where was the Mahi-Mahi option? Just sayin’. I went with the Chicken, and it was ok. At least there was some tropical color to it (which was probably just food coloring for all I know). It wasn’t anything special, and I’ve certainly had better food in economy class. 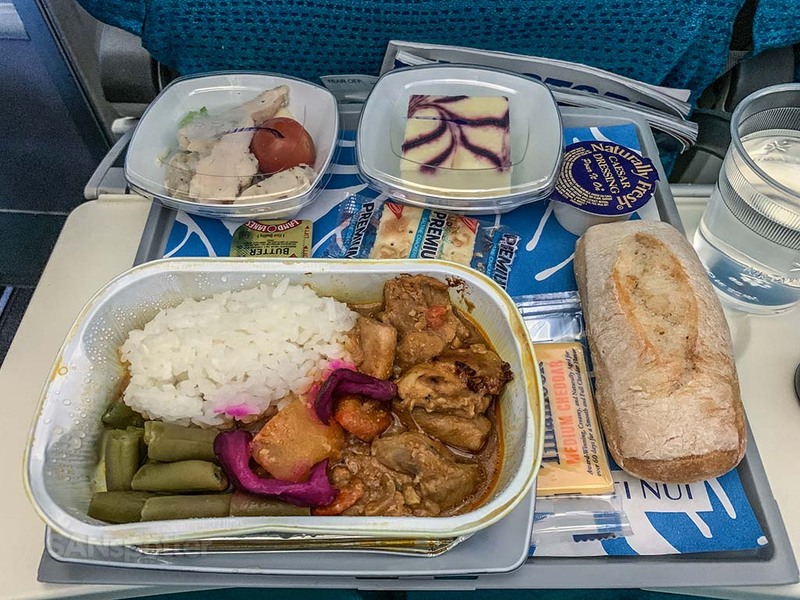 Still, to this day, economy class food on Turkish Airlines is my all time favorite. The Chicken. Overall not bad for economy class fare, but that purple stuff was far too unnatural looking to make me feel comfortable eating it. Of course I ate it, but…I didn’t feel comfortable. Looks as if he’s debating eating the purple stuff as well. The time between meals was largely a blur, for several reasons. 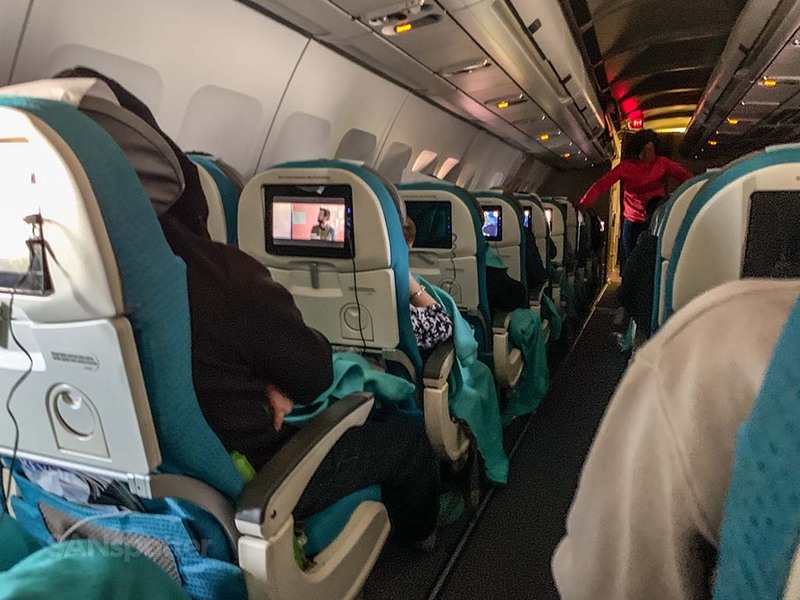 First, it was absolutely freezing for the entire flight, and people were pulling their winter jackets out the overhead bins and strapping them on with vigor. I didn’t have any winter clothes with me, so I had no choice but to just sit and suffer. Second, I watched a few really good movies which held my attention (Bohemian Rhapsody was brilliant BTW), and the flight was pretty much over by the time I was movied-out. Do I dare get up and use the lavatory again? For all my luck they’d roll out Mahi-Mahi skewers and coconut drinks (straight from real coconuts) while I was up. I’m not going to make that mistake again, so I’ve got not choice but to sit here and wait! 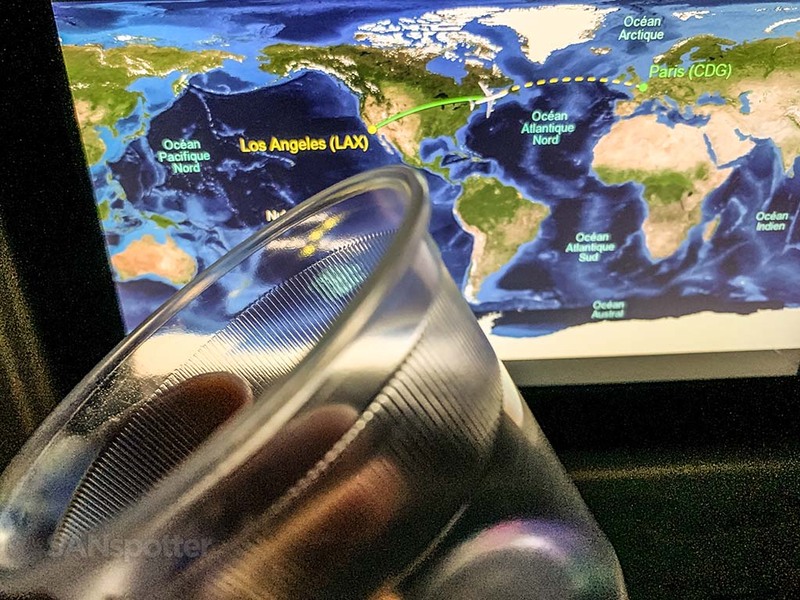 We’re just about to start the Atlantic crossing, and I’ve got my cup in-hand and prepared to receive a coconut concoction so pure that it’d make me ignore the fact that we were flying away from Tahiti at a blistering 600mph. Sadly, it never came. The “Cheese Omelette” sticker totally ruined the surprise. Is it weird that the very first thing I thought of after pulling off the lid was how the ham and the omelette were the exact same shape? Why is that kind of stuff so dang satisfying?? As expected, breakfast was so-so and it did its job of keeping alive until my next meal. That’s all one really needs in a tray of airplane food anyway, right? Enough about the food. Let’s wrap this review up. 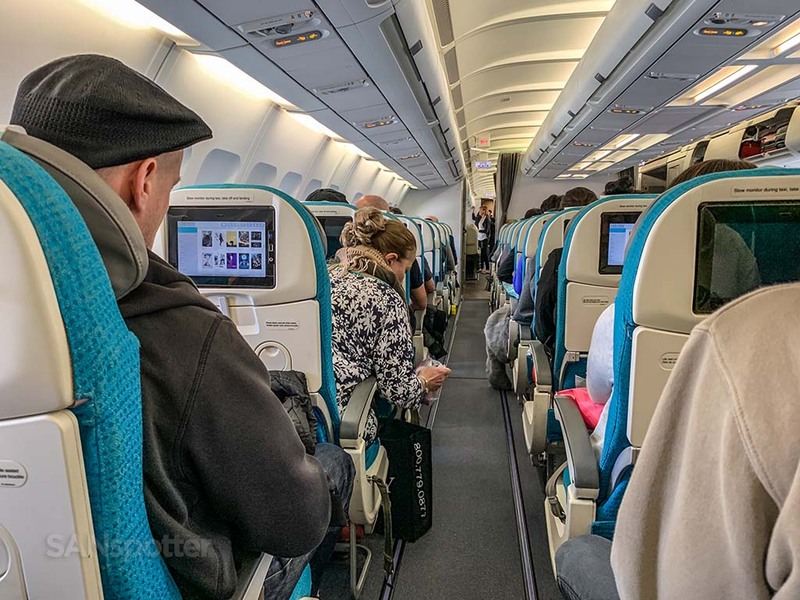 Our arrival into Paris was uneventful and right on time, which now that I think of it, is probably the best way to describe this entire Air Tahiti Nui economy class experience. I highly suspect that arriving into Papeete rather than Paris would have put me in a more enthusiastic mood to close out this review, but “uneventful and right on time” is a good thing is a grand scheme of things. We may be on the exact opposite part of the globe I would have preferred to be at this moment, but whatever. Paris is alright, and it’s been far too long since I’ve last been here. Bonjour vieil ami! Well, at least there are pictures of pretty palm trees on the video screens as we walk off this plane – though it probably did more harm than good as I stepped out onto the jet bridge and was brutally reminded of what early March is like in Paris. I can’t help but to think that there would be beautiful smiling Tahitians throwing flowers at us if this were Papeete. Instead, the first native Parisian I encountered was a airport employee who blurted out “je dois faire caca” to his buddy. One last look at F-OSUN before walking away. This aircraft was retired and replaced with a 787 just 9 days later, and I can’t help but to hope that it’s last few trips to Tahiti were good ones. Thanks for your service old gal! You flew Qatar A380 Biz? Can’t wait to watch the review!! Yeah, it wasn’t the Q suites, but it was still one of the best business class experiences of my life. It’s going to be a fun review to post! Your trip reports blow my mind. The only way I think you could improve them is to fly MORE !!!! Thanks and keep on posten. Thanks! These trip reports take a ridiculous amount of time to put together so flying (and writing) at a faster rate would kill me dead – I’m sure of it. Haha! How many miles do you have? You fly a lot. I burn most of the miles I earn! I’m in the process of building my balances back up again though, so my next few trips will most likely be paid for out of pocket.